This is a rather involved puzzle and might require a bit of stamina. All of the puzzle is in image form. The introduction text is not needed for the puzzle. At the end of the puzzle you'll get a short English sentence. The puzzle consists of several sub-puzzles and you're encouraged to post solutions to the individual steps - I will comment on them. The puzzles has now been fully solved, and the complete solution is summarized in the accepted answer. You're in a circular room with a dome-like ceiling. All walls and the floor are bright white. There is only a single, metal door, which has a small, circular whole in eye height. You don't have any recollection how you came here, but at the moment, you're really only interested in getting out. The door, is looked. You knock, and there is some movement behind the hole. Somebody comes to the door and talks through the hole. The voice, however, sound foreign and not very human: "You awake? You out? You say passphrase!" You are about to ask something, when suddenly the walls behind you begin to shimmer and form a series of images, and the voice through the door adds: "You clever? You find passphrase." Whatever else you say to your capturer, the only answer you get is: "No, not passphrase." It seems you really have to find the passphrase. You just hope you can, before you die of hunger and thirst. The following image is auxiliary for convenience sake. It is a close-up of the bottle labels of the 2nd image above. As always, I'm interested in your ideas and feedback. In particular, I hope the puzzle is fun. If it isn't, let me know why. If it turns out that the puzzles needs amendments or changes to become better, I'll edit them. 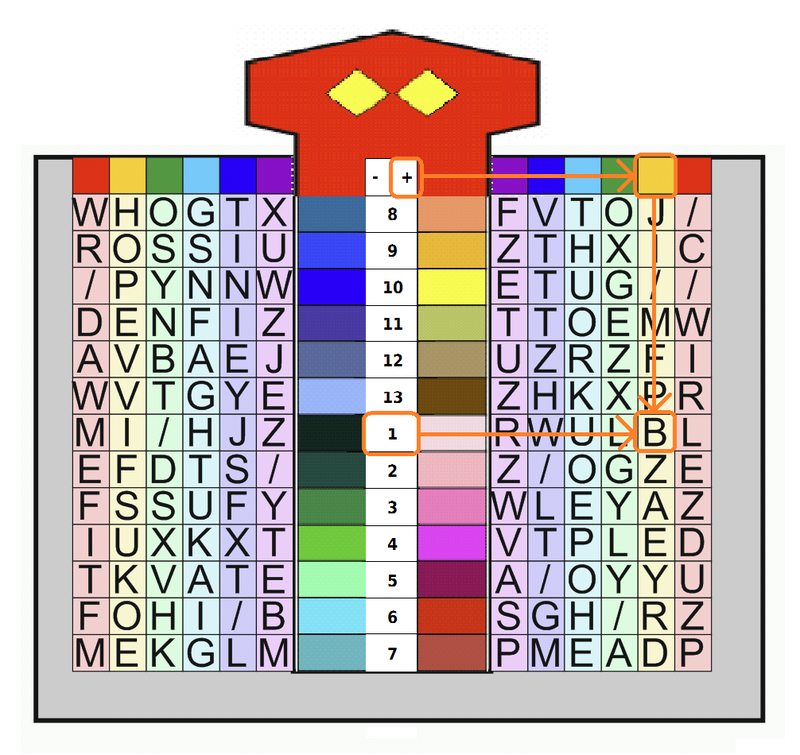 The red ABCDEF/1234 labels are not required for the puzzle. They have only been added to make it easier to discuss/describe solutions. You may use any tool etc. to solve this puzzle, but it should be perfectly possible to do this with pen & paper alone. Where am I even supposed to start this?? The first images until the first horizontal line are called instructions for a reason. Try interpreting them in terms of what is this puzzle about? and what am I to do? Really? Is there no clue about the length of the pass-phrase? Does this length match anything... ? Okay, okay, so what do I have to solve first ? The puzzle has 3 main-sub puzzles. Guess what, they are sorted that way. Let's call them the bottles, the scale and the code puzzle. The scale is (literally!) the central puzzle here. It provides the information needed to solve the code. But in order to attempt the scale you need information provided in the bottles. What could that be? Have another look at the instructions! What do the yellow squares symbolize? What does the blue-to-grey shading symbolize? So what could the labels then be for? All nice and well, but can you give me another hint? NO. If you are still stuck and don't want to spent more time on thinking, you might as well read the accepted solution below! This is a community-wiki answer compiling the final solution of the puzzle. It also presents the solution as intended. The solutions were found by individual answer posters. - Valuable ideas on how part 1 and part 2 are related. order. Otherwise identical bottles (they are all blue) have to be sorted in some way and then be used in this order. Also: The final pass-phrase is gotten letter by letter in correct order. The original grid of bottles is not in order. The labels and the yellow code-grid-table need to be used to achieve sorting. For the meaning of the code-grid-table see 'The Bottles'. The 24 bottles are needed in 'The scales'. They are used in the order determined by 'The Bottles'. They need to be filled into a single tube one after the other, while the hanging weight is moved at each step to keep the scales in balance. One key is the final puzzle piece. It is needed to complete the second part (The Scales). This single key needs to be inserted into the code-table. The pass-phrase is found letter-by-letter from the grid. There are as many letters as there are bottles (24), and their order is the same as determined by the first part (The Bottles). The aim of the bottle puzzle is to bring the 24 labelled bottles into correct order. The brown bottle labels are a transparent grid. If all are overlaid, only a single square remains fully transparent. Once that label is removed, there is only a single specific label which can be removed in order to get a third transparent square. etc. etc. This gives an order of labels. However, it is ambiguous as it is not clear if the order is first-to-last, or last-to-first. Checking the position of the "first" and the "last" transparent grid-square on the yellow code-table of hint reveals: Alpha and Omega. Alpha and Omega are the first and last characters of the ancient Greek alphabet. They are often used (f.e. in religion) to indicate Beginning and End. Spaces in the dot-labels are decoys and can be ignored. the total weight of filled pipes and the hanging weights. 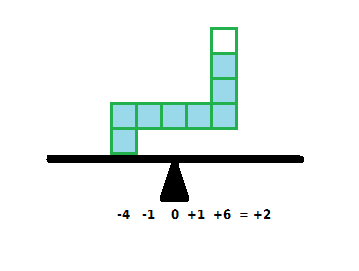 Each 'filled square' counts for the same weight, and the tipping moment is determined by the (horizontal) distance from the centre point multiplied by the (summed) weight at this distance. ...fill in the bottles one after the other into either of the 6 tubes, while keeping the system in balance with the hanging weight. The exact sequence has to be found by the puzzle! However, the order of the bottles is given (by the The Bottles puzzle) and there is only a very limited number of possibilities which can keep the system in balance at each step. A second solution is possible, which has bottles 11 and 15 swapped. However, only one of the two solutions (the one above) will produced an English pass-phrase in the third part of the puzzle (The Code). 24 ordered actions of pouring bottles into the grid. Each pouring-actions is defined by 2 things: A tube colour into which the liquid is filled and a hanging position for the balancing weight. This position is associated with a colour, but some positions are missing. Also: Colour-pairs (if watches as RGB hex-codes) add up to FFFFFF, i.e. are complementary. ...realized that the final situation after pouring all bottles left exactly two red squares empty. On the bottle, the squares are represented by yellow diamonds. The same dots appear on the keys, so the two yellow diamonds on the red key will 'complete' the puzzle as hinted at by 'Instruction 3'. Summarized I think the image tells us to empty the bottles in the right order through the right tube/color into the scale filling a certain amount of squares. This solution was figured out with the help of "Gary Ye's" essential observation! The first question to ask is whether the order of the bottles is actually important. The answer is YES. The blue shading of the bottles in INSTRUCTION 1 and the same shading of the letters in INSTRUCTION 3 clearly indicate a connection between a bottle and a letter of the password, i.e. every bottle corresponds to exactly one letter of the solution. And since the letter order in the solution is obviously essential, so is the order of the bottles. Although the blue shading indicates that the order is important it does NOT indicate that the darkest blue bottle is indeed the first one! So the order must be hidden in some other attributes of the bottles. Considering that the order must be unique and non ambiguous, the yellow dots can be ruled out and therefore only the labels remain. The important thing to observe here is that some pieces in the 8x8 label-grid are missing (i.e. not white or any other color, but missing). This means if we put them over the 8x8 code-grid some symbols will shine through. Even more important, if we put two or more labels on top of each other some symbols will still shine through. And this is exactly how the order is defined. Choose the next label so that when it is put over the first one there are still exactly 23 symbols visible, A2. Repeat the same process for the remaining labels so that 22, 21, 20, 19, ..., 1 symbols are visible. This is the order of the bottles with the top one being the first. Note that the last visible symbol is A (or Alpha) whereas the 24th symbol is Omega. That might be an indication of the otherwise arbitrary seeming choice in step 1. This completes the code-square and the labels (and probably also the blue shading). Now that we know the order in which the bottles have to be emptied, the next thing we have to figure out, is through which tubes to empty the bottles. 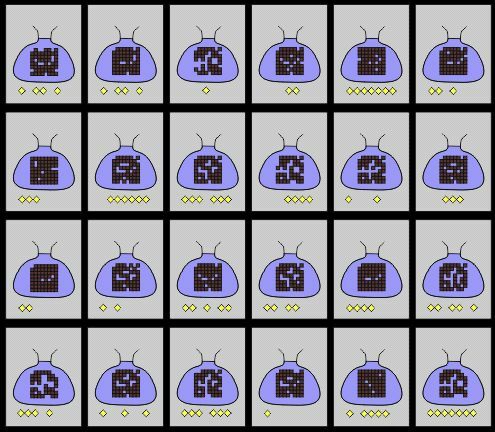 Assuming that the labels, the shading and the code-grid are already completed, likely the yellow dots contain this information. Especially considering that the first bottle has exactly 5 yellow squares and INSTRUCTION 2 shows that the first bottle must be emptied through the 5th tube. Considering that figuring out the order was rather tricky, this might be a little bit to o simple though ... I would guess that the spaces between those dots are also really significant (as they were in the labels), but I don't have any concrete ideas about that at the moment. Considering that there are almost no instructions left for the bottles, the amount of squares to fill by every bottle might even be constant, or actually maybe 1. The only real other possibility I can see is that the yellow dots could indeed describe both the tube and the amount of squares. LABELS isn't really important, just there to help us with BOTTLES. The OP has intimated that SCALE is the key to the whole thing, so let's take a careful look at SCALES. We have six tubes, labelled by different colours, from which liquid drips down into six pipes, which lead to different points a balancing scales with two small grey weights on each end and more odd colours. Look at INSTRUCTION1. The left half is still a mystery to me, but the right half shows bottles being emptied into a tube of the same type as those on the scales. There are 5 bottles full of greyish-blue stuff, and 5 squares coloured greyish-blue, so I suspect each bottle in BOTTLES is going to fill up one of the small squares in SCALES after being poured through one of the tubes at the top. Now INSTRUCTION2. We have a sequence of 24 bottles (the same number as in BOTTLES), and two more of those small grey weights. The first bottle at least gets poured into the 5th of the 6 tubes. The scales end up tipping one way or the other. What about INSTRUCTION3? We have a miniature version of SCALES printed on a big square, from which one corner in the shape of a jigsaw puzzle piece has been removed. This piece has a key on it, in the shape of one of those in KEYS. The piece is placed in a circle of 6 keys, one of which is chosen and inserted into what looks like CODE TABLE. Five cells in this table then have colours like those of the five outstanding bottles in INSTRUCTION1. I now suspect the squares on the bottles are something to do with colour codes (for which there are several different conventions). I spotted that many of the 8x8 grids contained in the bottles have very similar patterns. 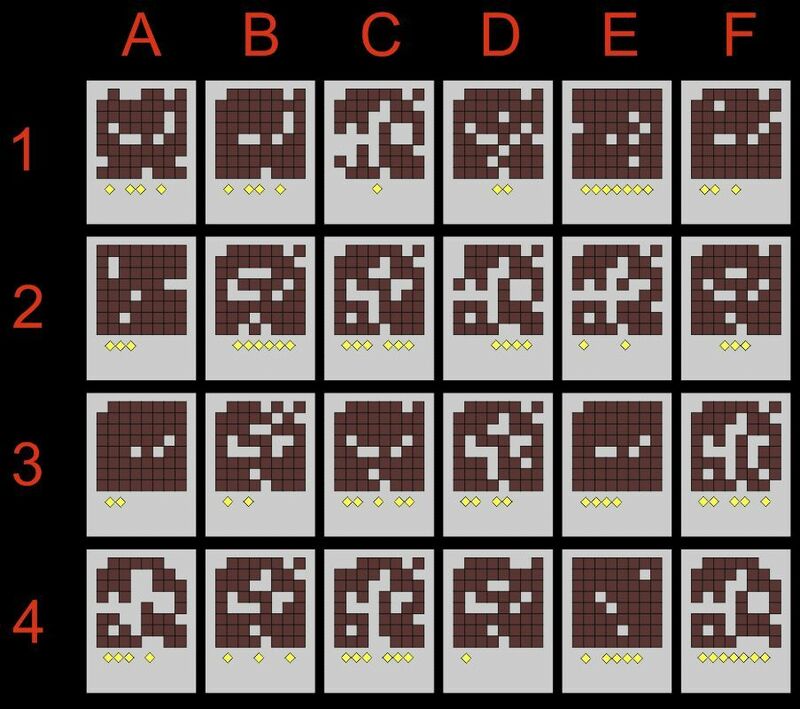 I have summed up the grids, by saying white = 1 and black = 0, and I received the following interesting but definitely not random pattern in which the numbers 0 to 24 all occur once (except for 1 and 2; 2 occurs twice). I'm thinking that the symbols 8x8 grid is a big clue, I'm not 100% sure, but I think, that every symbol stands for a character, I didn't get very far till now, but I got a few symbols substituted by what I think the meaning of them are. I also think, that if you have all, you can overlay the bottles 8x8 grids over it and get hints for INSTRUCTION 1. Most of the substitutions I found in the font called Symbols in Microsoft Word. Some of the Japanese characters I knew myself. This is more of a brain dump at the moment, but hopefully it can help someone. 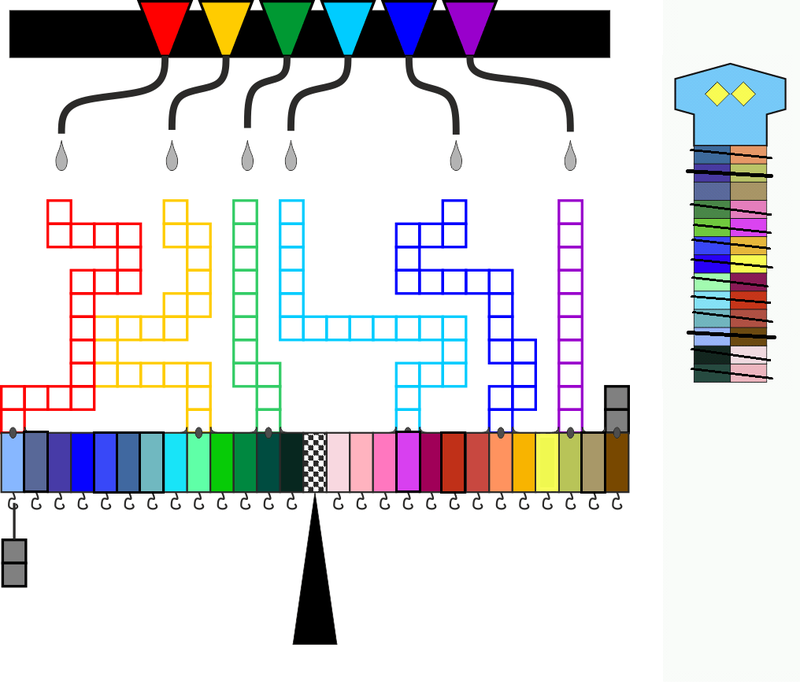 The last image is a key for the second last - the color at the top indicates for which columns the colors are a key, and the left column of colors is a key for the left column of the code, and ditto for the right. The BOTTLES ( LABELS ) image has a series of 8x8 grids with holes in - this most likely corresponds to the 8x8 grid of symbols in the INSTRUCTION1 image. How, I don't know. at the top left there are 6 bottles not colored the same. I have labelled them starting from the most blue. These correspond to the grid coordinates C2, E4, A1, B4, F1 and A3 respectively. These also might correspond to the six colors in the code in the SACLE image. I did not get anything useful by overlaying the holed grids that correspond to those coordinates onto the symbol grid. But maybe I just didn't notice a pattern. Here's a frequency analysis. Odd how there are so many Zs. The puzzle might even be able to be broken with cryptanalysis of the code. The colors in the left and right columns are always the same, just in a different order. This would lead me to conjecture that one must use this color key to reorder the corresponding column in the CODE TABLE image, after which something will be spelled out. These colors also correspond to the ones on the scale in the SCALE image. Ok. I've mostly been following this thread from my phone while I'm at work, so I haven't managed to read most of the work already done. The hanging weight on the scale seems to be movable. And I'm guessing that given that the weights are divided in two segments, these weights probably equal the weight of two square-units-worth of liquid. Unfortunately, I don't know how weights and scales work in regard to distance from the center. The diamonds on the top of the key are the same as the diamonds on the labels on the bottle. This probably indicates which tube the bottle is meant to be poured into. The right-hand side of "Instruction 1" seems to indicate that the first (darkest) bottle will fill up five square-units. Using this information, it's not unreasonable to suspect that the next-lightest bottle will fill up four SU, then three, down to one SU for all of the grey bottles. Using the labels, we can determine (as @i_turo has shown) the order in which the bottles should be used. By overlaying the labels onto the 8x8 grid in "Instruction 1", we see that it slowly covers up (what I'm assuming is the entire Greek alphabet, as most of the characters I know are in the grid, and the Greek alphabet contains 24 letters) the symbols in reverse from Omega to Alpha. The opposite order (A > Z) should probably be used to pour the bottles. 2.) Now that we know what order to put the bottles in, we have to determine which tube we pour them down. This is most likely determined by the yellow diamonds on the labels, as they correspond with the colors on the keys. Unfortunately, I'm not good with codes like this so I'm not sure what to do. But we need to find a way to translate the label-diamonds into colors somehow. We do know, however, that there are only six color-tubes while there are 24 different layouts of diamonds. So either the colors can be represented multiple ways using this code, or the code changes each time we remove a key and replace it. ...is that the six keys begin in a line (Red, Yellow, Green, Cyan, Blue, Purple). If you line up all of the keys and allow each 2nd-diamond to correspond with the 1st-diamond on the next key, you have a pattern of AB BC CD DE EF FG. This gives you 7 diamonds overall (the number that appears in the labels), ABCDEFG. Once we remove the blue key (now EF) to use it in a moment, we slide the keys over, then replace the blue key at the END of the line (making it now FG and purple becomes EF). Then we use that arrangement to determine the color for the next bottle. When we pour the bottle into the tube, it will fill up the squares in the row corresponding to the tube color, as shown in "The Scale". We can determine how many squares will be filled up by using the blue shading, as earlier discussed. Since bottle E4 is first, and it appears to have a color matching that of the first bottle in "Instruction 1", we can assume it contains 5 SU of water. So when we pour E4 into the blue tube, the scale will tip to the right. When the scale tips, we have to move the hanging weight to make it balance again. The free-standing weight is clearly fixed in place. So we have to play with the hanging weights until the scale becomes balanced, then look at which section of the scale the hanging weight is occupying. We insert the key whose color corresponds with the tube through which we poured the water into "The Code". Then we find the letter at the cross-section between the color of the space the hanging weight is occupying (indicated on the key itself) and the color of the key/tube that we used (indicated by the columns in "The Code"). That gives us our first letter. We repeat this process until we're done. The final result may still be in some kind of code, though that doesn't seem to be indicated anywhere in the pictures. The picture that @Tryth shows indicates that there are six differently-colored bottles of liquid instead of five, as all of the other pictures with shading show. This would imply that the C2 bottle contains 6 SU of water (or that 2 of the bottles have matching colors). If that's the case, then why is that sixth colored bottle not shown in the other pictures, specifically the ! speech-cloud in "Instruction 3"? Some more progress has been made since I posted this answer, now I'm choosing to edit it to reflect what we know. 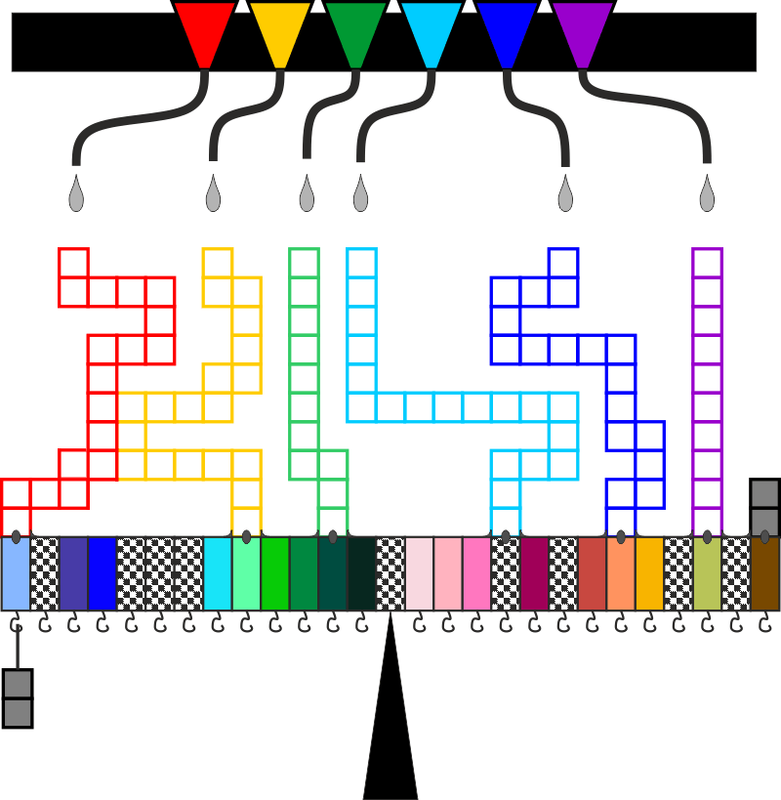 I used the keys to finish the scale's color spectrum base; the edited scale has been added by Bmy to the wiki answer with an explanation of the logic involved. The issue we are facing now is deciding which tubes the bottle contents need to go into. We have supposedly used up the meaning of the 8x8 grid, where it was relevant to determining order. The yellow diamonds are the only label we have not fully understood from the first instruction, and it is believed that this is where we will determine the placement of the contents. My current line of thinking holds that the yellow diamonds tell us the amount that the respective bottles will put into the tubes. This is supported both by my counting (95 empty tube spaces, 93 diamonds) and by Bmy's upvote. However, if this were all that the diamonds tell us, then we would still have no information on which tubes to fill. The only piece I can imagine being useful is the spacing between the diamonds. It has been made clear that the labels are supposed to be center-aligned, and thus the left/right sides of the diamonds don't mean anything. Only the spacing /between/ them seems to matter here, though it could still be that it has no meaning at all. In such a case, for example, bottle 14 and bottle 20 would be the same with regards to their diamond pattern. The question to be answered, in short, is this: what does the diamond spacing mean? I did some testing on a selection of ideas. My first idea was that the spacing simply described how many tubes each bottle is divided into. Our first bottle is a 1_4, so this idea would claim that one unit goes in one tube while the other four units go somewhere else. Presumably, this also suggests that the 1 unit will go in a farther left direction than the 4 units, based on their order on the label. This is all well and good, but following it through encountered a problem very early. [-13, -5, -2, 4, 8, 11]. This means the force that the bottles apply to the scale will always be in only these 6 locations. The weight can be placed on any hook, which you'd think makes things easier. Unfortunately, the weight is 2 units in size. Therefore, any force the weight provides to the scale will be an even number; an even number multiplied by any number always results in an even number. Therefore, to keep the scale balanced, we must ensure that the forces the filled tubes apply are even amounts as well: to balance an even force on one side requires an equal force placed on the other. It means, young padawan, that our bottles that have an odd number of diamonds must fill only tubes standing on even numbers. For example, if we take a 3-diamond bottle and fill the yellow tube at location -5, then that would be -15 units of pressure on the scale. We cannot put the weight anywhere on the scale to perfectly balance 15 units, because the hanging weight cannot provide an odd numbered amount of pressure. Looking back at the first bottle, our 1_4 bottle, lets assume that we must follow the rules I stated above. The 1 unit must go into an even numbered tube [-2, 4, or 8]. The 4 units should go into any tube to the right of that [4, 8, or 11]. Unfortunately, this is already impossible - putting 4 units into the 4 spot is 16 units of pressure, plus the 26 units of pressure already on the right end = 42 units of pressure. The 1 remaining unit of liquid and the hanging weight can only provide 28 units of pressure combined at maximum, not enough to balance the scale. That might have been a lot to process, so let's make this easier. We have weight already on the right end. We must put weight on the left end of the scale to balance it. Of course, pouring the first bottle's contents into a tube on the right end would only make things worse. We can't pour the first bottle into the odd-numbered tubes, either, because its force cannot be balanced by our even-numbered hanging weight. By process of elimination, we can only pour the bottle - all 5 units - into the green tube. Things begin to look better: 5 units * -2 distance from the center = -10 units of pressure, + 26 units from the right hand side = +16 units of pressure on the scale. To balance this evenly with an added -16 units of pressure, the weight must be placed on the -8 hook. You might be thinking, "Great! We have a plan." Unfortunately, this plan doesn't continue very far. Long story short, we can't keep putting odd-numbered diamond bottles into even-numbered tubes, because we will end up favoring the green tube too much and cause it to overflow. All of this means something is wrong somewhere. Whether it was my analysis of the scale, or my analysis of the diamonds, something is not matching up properly. My most recent failed idea was ignoring the spaces between the diamonds. I interpreted instruction-2 a bit more literally, and thought maybe the hanging weight's current location was our clue for where to pour the next bottle. The fact that the weight is already hanging on the scale at the start of the puzzle gave the idea some credence, so I followed through. As before, we can't put only one unit nor all 5 units into the red pipe, as it would provide an odd pressure or too much pressure, respectively. The remaining option would be to put 4 units into the red and the remaining one elsewhere. This yielded multiple answers, somewhere around 9 different possibilities, but I remembered that this scenario has an additional rule: the hanging weight must be under a pipe so that we can identify where to pour the next bottle. There was only one solution that allowed this, which was pouring the last unit into the cyan tube and placing the hanging weight under the purple tube. This is where the idea fails, however, as we next have a 3-diamond bottle which is to be placed into the purple tube. 3*11 is 33, an odd pressure, and once again cannot be balanced by our even-sized hanging weight. It seems this is the only remaining difficult point to reason out in the puzzle. I figure once we have a system that works without fail, it's just a matter of applying it to reach the answer. Almost certainly, the code will be broken by selecting the key related in color to the pipe that the bottle fills, selecting the line with the color that the hanging weight is beneath, and matching it with the same colored column as the key. For example, if the bottle fills the red pipe and we had to place the hanging weight on hook 4, then we'd insert the red key into the table, select the 4th row from the bottom (where the bright purple is), and select where it meets the red column on the same side, which happens to be the letter D. Noted, for this reasoning to be correct, it assumes that the whole of each bottle is poured into only one tube, which conflicts with most of my other reasoning above. I fear that I have overlooked something very basic and that all of my work and thinking has been flawed from the very beginning. I started into this puzzle today, hopefully I'll get to help you guys out solving this. I see you've made some good progress. I noticed something regarding the scale section, in that there were blank spots where there should be colors (like where the cyan tube ends). 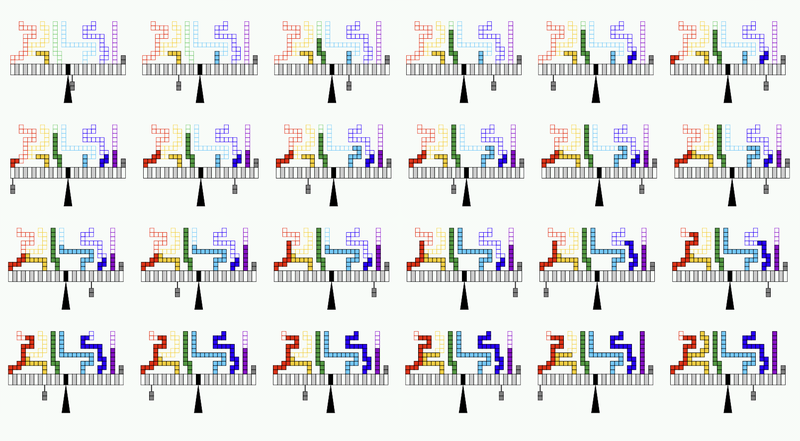 The keys offer a solution to this, since all the keys have the same color pairs, and those color pairs match up perfectly to their spacing on the scale. Let's take a look at the tubes. Those things are awkwardly shaped and must have a reason for it. I hypothesize that the tunnels are not actually in the right place. There's that weight on the right hand side; could it actually be a pipe with grey contents? If this is the case, then my hypothesize holds water (excuse the pun) - that is, we now have a correlation between the dots and the scale - 7 dots against 7 pipes. We would probably need to reorganize the pipes on the scale and see where the weight distributes itself when the pipes are full of a color. My second hypothesis comes from looking more closely at the first instruction. It clearly shows the diamonds on the example bottle, so it's possible that it is giving us a clue about what the diamonds mean. From what it looks like, the diamonds are the amount of a color there is in the bottle, and it is pouring into a tube that already has contents. In this case, I suspect that the contents of the tubes persist, and our weight calculations will compound as we go through the bottles. We will be able to identify our mistakes by any tubes that are overfilled. Furthermore, there are times when we see up to three sets of diamonds on a bottle - this would indicate three different colors, if this hypothesis holds true, and we must compensate for that in our analysis. *Note: I counted up the number of spaces in the tubes (95 empty) and the number of diamonds on all the bottles combined (93). Assuming I counted accurately, the fact that we can "fill the tubes with diamonds", so to speak, helps support the hypothesis that the diamonds represent the amount of something in each bottle. We're down to the final part of the puzzle. Note: this is the solution to the final instruction. Check the wiki for the first two parts. Clearly, the scale work was the more difficult part. Now it should be smooth sailing. Our solutions to the first two parts are in the wiki, and I'll be making reference to those here. The final instruction has four parts. The first two parts are relevant to selecting the key(s) we need, while the last two parts are the process of using the key(s) to get letters and put them into a sentence. There are a number of ways to go about this, but only one will be the right solution. It's just a matter of figuring out each part in detail. Noting the final scale, we see that all of the tubes have been filled except one; the red tube is missing two units. The diamonds were our indicator for how many units filled the pipes, and there just happen to be two more diamonds on each of our keys. It seems quite obvious that this means we are supposed to use the red key in our solution, as the red key's two diamonds represent the missing two units on the final scale. Side note: Does this change the weight on the balance? 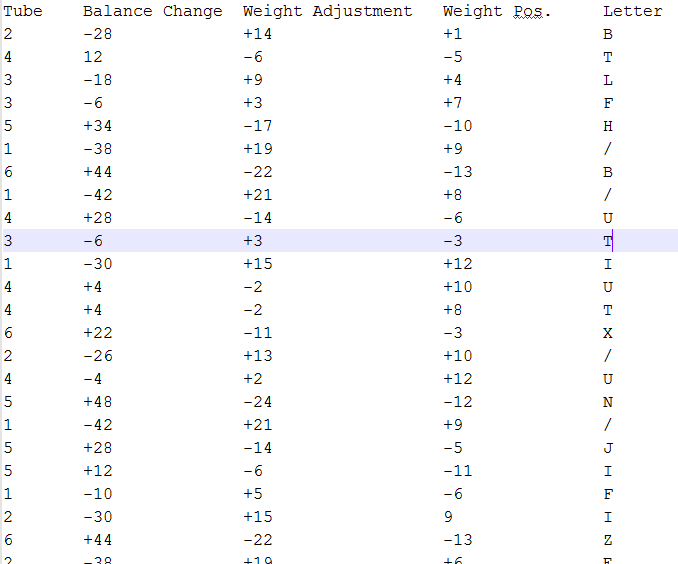 No, because adding two more red units is an additional 22 weight to the left side of the scale, which without the hanging weight's presence is a total of 34 weight on the left. The hanging weight would be unable to bring balance to the scale. So, we have identified the use of the red key in finding our answer. Is it the only key we use? Yes, because the means of identifying the red key cannot be applied anymore to identify other keys. It is reasonable to believe that the red key is an anchor and will be used for the entirety of the final puzzle. Is it an anagram? No, because the final instruction's last part shows that the letters are placed in order. The hanging weight's position for each bottle is a clear indicator of which color - and in turn, the row - on the key we need to be looking at to determine the letters we need. The original author says that the final solution will be an English sentence, so we will be able to check our progress along the way if we run into a selection of letters that does not make up an English word. What is the title to this question? What is the password in the image? 3D ring/rope wooden puzzle (Eureka) solution?